How to use a nail gun to help complete your project quickly and safely. Nail guns are becoming a very popular tool due to their ease of use and speed in which you can fix materials such as match boards, so much so that they are now replacing the more traditional hammer. In this project we explain what a nail gun is and how they work and also what you need to know in order to use these potentially dangerous tools safely. A Nail Gun is a tool which is used to drive a nail, brad or pin into another material using compressed air, explosive charge or flammable gases, the most common being compressed air for the DIY market. There are large and more complicated nails guns which are used in the construction industry for use when nailing into metal and concrete. These Nail Guns normally use the (powder-actuated) individual explosive charge (much like a bullet) method of fixing a nail as so much force is required. These charges come colour coded in order of strength, and should only be used by an experienced or qualified operator. 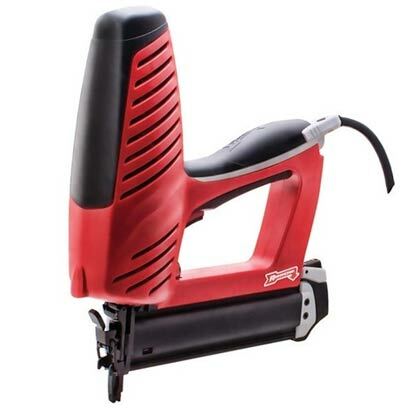 Most common compressed air and electric nail guns come with a built in clip loading device which allows you to use a strip of pre-joined nails for speed and ease. These nails come in different lengths and gauge (thickness) for different uses and strength of fixing. For compressed air nail guns, you will also need lengths of pneumatic hose so that you can work in your work area which may be a small distance from your compressor unit. These items can be found in the ‘top tools’ section to the right of the page. Most nail, brad or pin fixings come with heads which will need filling on finer works. Some suppliers do offer headless fixings which will not need filling before decorating. Nail Guns have become common use now mainly because of their ease of use and speed, that the old hammer is hardly seen now on more commercial construction sites (technology moves on). Most Nail Guns need to be in contact with the object they are fixing to engage the trigger action before firing the nail. This is more a safety procedure than anything else (these are very dangerous tools). When using your nail gun, first make sure your power supply is activated i.e. 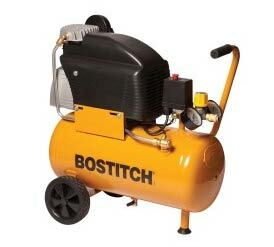 compressor, electricity or gas cylinder. Check you have the correct nails for the job you are undertaking and the materials are in the correct place to be connected. Place the nail gun firmly against the surface you want to fix through and pull the trigger without jerking the gun (gently does it). The nail gun will fire the nail and your section of materials will be fixed in position. You may repeat this process till you feel the items are secure. When you have finished using your nail gun always make sure you turn off the power supply to the device. Remove any remaining nails from the gun and put it away in its case for protection. As always with machinery that creates dust, debris and has sharp components DIY Doctor always recommends the use of gloves, dust masks and eye protection.